I woke up this morning wondering what to do (much like I am right now actually) for the next day up in Peak Week. 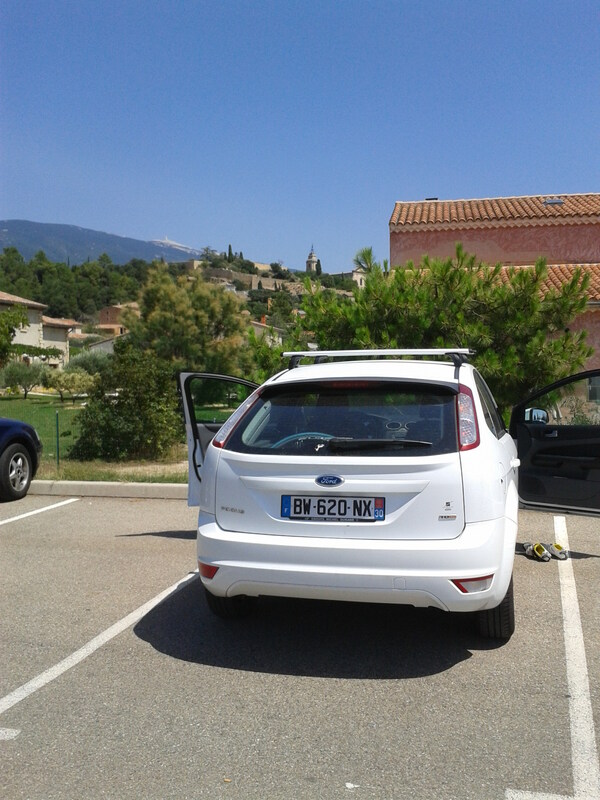 Erik and Anne weren’t around to tell me where to go and I really didn’t want to drive back up to the Cévennes again. Not wanting to put much thought into it, I set myself on auto-pilot and ended up here. For the keen sighted, that’s Mont Ventoux in the distance. I had to park outside the village for the first time because it was market day. Other than there being no toilets, this parking lot was great, and I could strip down à la française with not much of an audience. I intended to do either 1.3 (one climb and a Chalet Reynard-Summit hill repeat) ascents or 2. The 37 degree heat in the forest dimmed my motivation a tad and I ended up doing ‘just’ the former. At the top the first time I snapped these three photos in literally a minute. 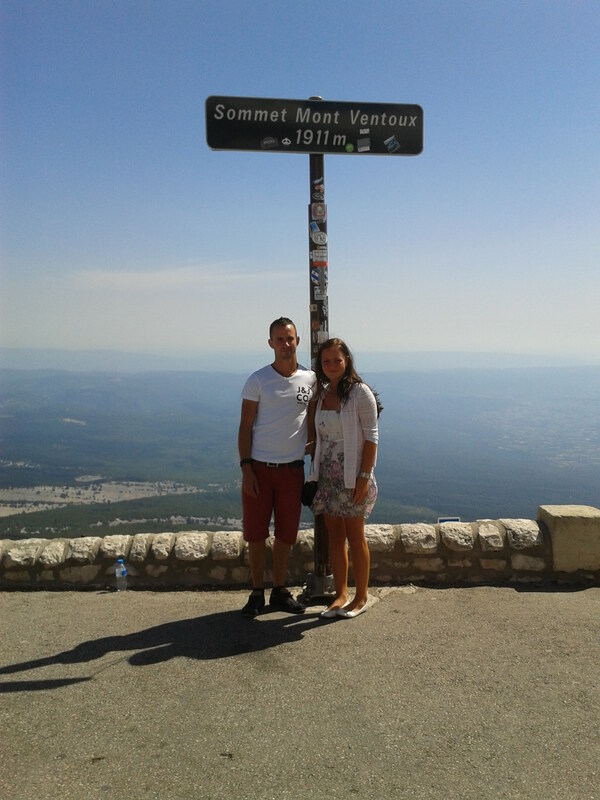 There is a steady stream of people wanting their own souvenir of Mont Ventoux all day long. You need to be quick and assertive to get yourself in there before hypothermia sets in (not a problem today, mind you). And I found something new on top of Ol’ Baldy. The summit is now one way for cars (they need to take the road on the right then loop around, which I think is a good idea. They have also added this lane for cyclists (middle of the photo), which I think is a good idea in theory. The trouble was, when I came up the first time there were a bunch of pedestrians walking up and down, 3, 4, 5 abreast, completely unaware that there might be someone cranking around the hairpin, and who certainly wouldn’t want to put a foot down a few meters from the top, having spent the last 1.5, 2, 3 hours suffering up the mountain. I did a lot of yelling ‘Attention!’ and got through the crowd unscathed. Still, I can see some issues with this new arrangement. I think a better idea would be to make two equally sized lanes. One for Belgians and Dutch, the other for the rest of the world. That would even it out nicely. How am I feeling? You’re so kind to inquire again. My time up from Bédoin was 1:37 and the heat in the forest slowed me down a little I think. I’m taking this time as a good sign for Haute Route, which will be a lot tougher of course, but the legs are still working after 5 days of hard-ish effort. I am sure that the key to success in Haute Route (where ‘success’ = ‘finishing’) is miles in the legs. You can fake it through one or two days if you’ve done some training, but my impression of this event is that reality hits on the 3rd day, then keeps sticking it to you for 4 more after that. I feel about as good as I can with my legs at the moment. My knee doesn’t even hurt too much, which is also a great sign. On my final descent I stopped for a fill-up at the Fontaine de la Grave (great water!) and ran into this friendly Dutch couple. They were hiking, but the conversation took a quick turn towards cycling. Turns out the guy is ‘Diable Ruud‘, a mad Ventoux climber who has done it something like 127 times (correct me, Diable, if I’m wrong). He is called ‘Diable’ because he has done 5 climbs in one day. Yes, you read right. That equates to 231 km and 7,663 m in elevation gain. Diabolic indeed. 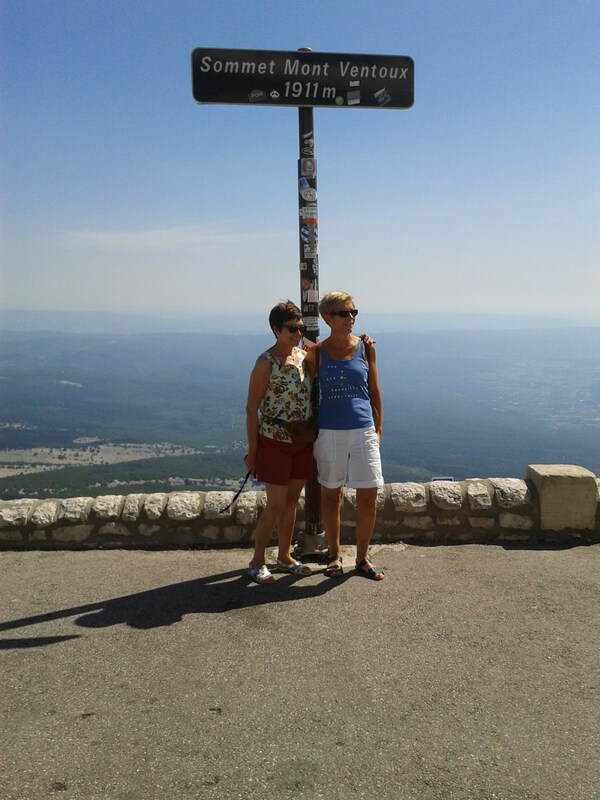 His wife, whose name I didn’t catch, has also climbed Ventoux many times, including multiple Triples. Just when you thought you were something pretty special, you meet people like this! Last week and first 2 days of this week was supposed to be my peak week. On Saturday I was supposed to go with a veloclub member for an ‘easy’ ride. He got a text from a friend to go with him on an ‘easy’ ride. I tagged along. Turns out the friend is a pro and there are apparently different definitions of ‘easy’. Mine doesn’t include 15% climbs. The heat got to me again and bonk/dehydration number 3. So I’m impressed you’re doing 37C temps. I’m scrambling now to find salt tablets that I can take along the HR. I don’t sweat a lot. I’m lucky. How is the rest of your Peak Week going? I don’t sweat either. I deluge. Peak week turned into peak 3 days only. About 300km and 4600m. Guests at my house is my excuse. It is suppose to rain for the next few days and unlike Rob above, I don’t particularly like the rain but it may be a great alternative to the heat. Good excuse. I should have invited guests over this week! I also hope you are right with “miles in the legs”; I will call it “hours in the legs.” While I have my best fitness, lowest HR, it does not mean I would set record climbing times. I feel more like a diesel now. Not just the weekend – the afternoon. Bedoin is only 1.5 hours away! Are you doing hill repeats on that climb? Yes, ‘hours in the legs’ is better. Or better still, ‘elevation in the legs’, since that’s really what we’re talking about when we talk Haute Route (I hope, since that was my main focus this season!). Peak Week is in the bag and now I have to figure out what my taper will look like. I think I’ll take tomorrow off completely. I look forward to reading about what you’re going to get up to for the rest of the time before you fly off. I notice the sky is blue in all your pictures. Training in Calgary, I’ve forgotten what that is. I’m still in Peak Week, day 4 of 6 was in the pour raining, again….for 120km of a 150km ride this time. That’s 600km in 4 days, enroute to 900km for the 6 days, and because it seems to rain everyday, I’m now able to clean my bike and have it prep’d for the next day in under 20 minutes. I wonder if there’s a competition for that? Sunny indeed. I’m not sure I would be able to focus on Haute Route with crap weather like that. It’s so much easier to train down here than just about anywhere else it seems. I can count the rainy days I’ve had on one hand this season, I think. I’m glad about your knee. Thanks, so am I. I was really concerned there for awhile because I had my saddle set in the wrong position for a week or more (lent the bike to a client). Millimeters make the difference between pleasure and pain. And I’m glad about all of it, way to pedal! Also just learned that one of your teammates is riding not too far north of me in VT. It’s hilly, but not like there. Oh? Does he live there? Maybe you mean Jan? Not a teammate. He’s ‘the competition’! ‘One for Belgians and Dutch’ — ahaha!! 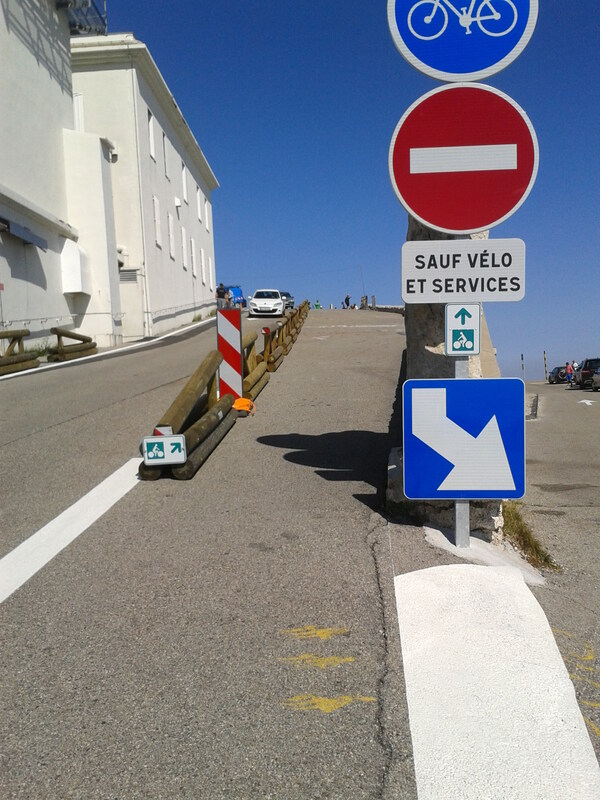 You’ve obviously been up Ventoux, Chikashi! Not yet, still on my bucket list. I have seen adverts in Belgium for organised trips. The gaggle of punters shown in the brochure photos is quite amusing, and I had imagined the congestion at the summit! !